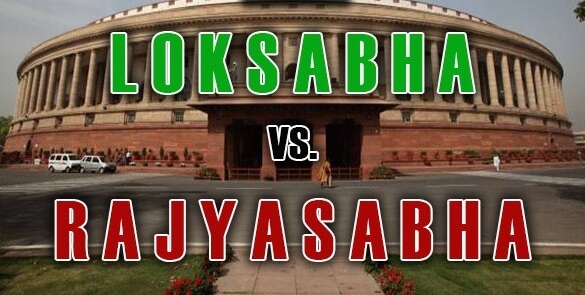 Elections to Lok Sabha and Rajya Sabha are conducted directly and indirectly. 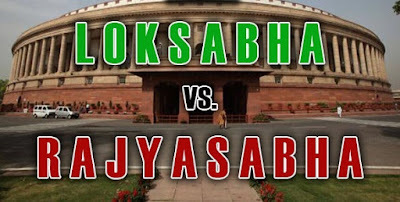 Elections to Lok Sabha - For electing members to the Lok Sabha, direct elections are conducted in the territorial constituencies where people vote directly for the representatives of different political parties. 1. Every State of India is allotted a fixed number of seats in the Lok Sabha and this process is done in such a manner that the ratio of the number of seats allotted to the State and its population is same for all the states of India as far as possible. 2. After deciding the number of seats allotted to a particular State in Lok Sabha, territorial constituencies are formed in the state in such a manner that the ratio of the population of each constituency to the number of seats allotted to it is same throughout the State. However after every Census the seats allotted and constituencies made have to be readjusted in order to account for the population rise. But for effectively encouraging population limiting measure, the 42nd Amendment Act of 1976 froze the seat allocation to the states in Lok Sabha and also the division of States into territorial constituencies till the year 2000 at the 1971 statistics. Further through the 84th Amendment Act of 2001, the restriction on readjustment was further stretched by 25 year till 2026. However the 84th Amendment Act of 2001 and 87th Amendment Act 2003 allowed the rationalisation and delimitation of territorial constituencies on the premise of 1991 census and 2001 census respectively without altering the total number of seats allotted to each state in Lok Sabha. Seats have also been reserved for the Scheduled Castes and Scheduled Tribes in the Lok Sabha and after the promulgation of the Constitution this measure was to last for 10 years (till 1960) but since then it has been extended and through the 95th Amendment Act of 2009, the reservation of seats have been extended to last till 1960. Elections to Rajya Sabha - Elections to the Rajya Sabha happen indirectly in India. Members of the legislative assembly of all states and in Union Territories Delhi and Puducherry elect the members. The members are elected through the method of Proportional Representation by means of Single Transferable Vote. This is same method through which the President of India is elected. Method - Suppose there 4 vacant seats for Rajya Sabha through a State and 150 Members of Legislative Assembly. All these members will vote preferentially for this candidate and each candidate requires at least (150/(4+1))+1 vote to win. In this case 31. What this method does it that it enables minority party to get their representative in Rajya Sabha. For eg. there are three parties having 65, 43 and 42 MLA's. So looking at the above figure we can say that parties having 65 MLA's can get 2 representatives elected and party having 43 and 42 MLA's can get 1 representative each elected if they provide first choice of a particular candidate.